It's April! 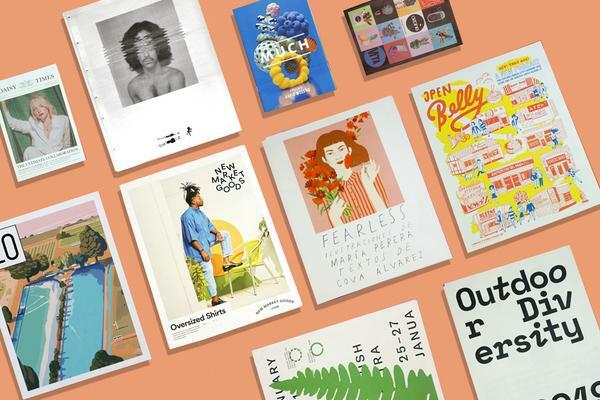 If you're putting off some much-needed spring cleaning, let this month's roundup be a pleasant, paper-filled distraction. 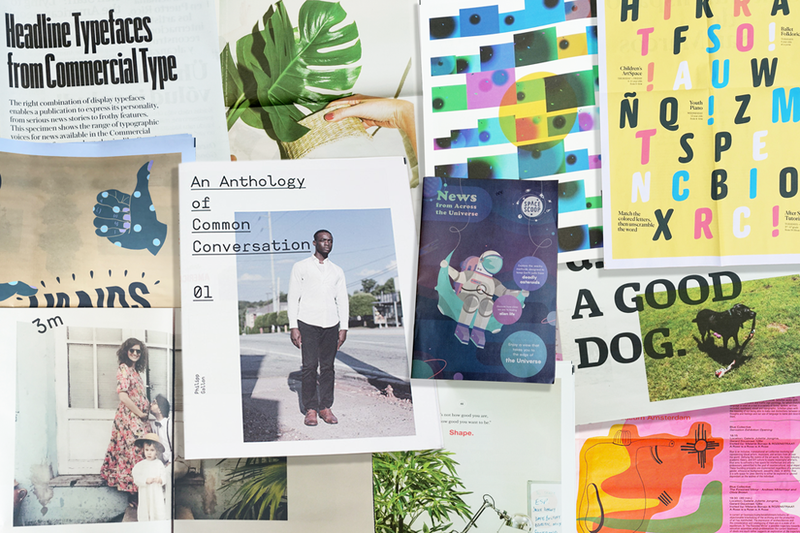 This time, we have a news service about the cosmos for kids, a typographic poster celebrating Mexican culture and a sweet obituary for a very good dog. 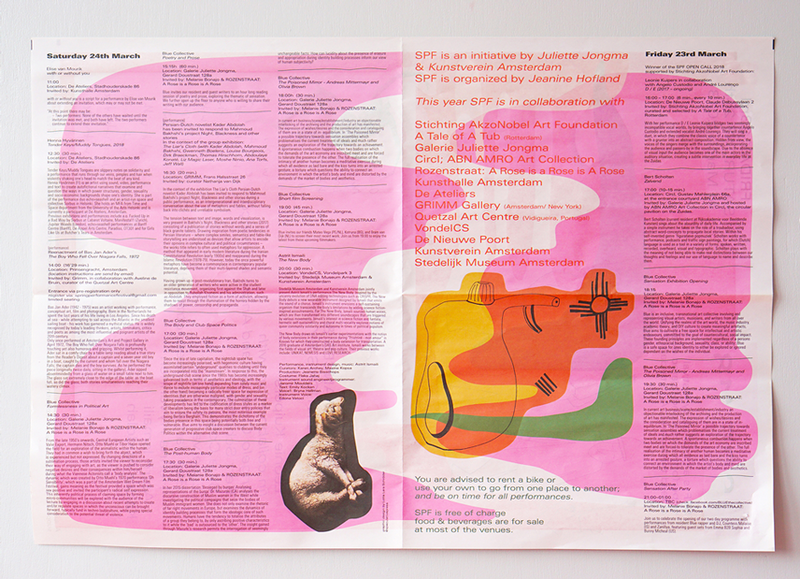 SPF stands for Spring Performance Festival – it's an annual performance festival hosted by local galleries in Amsterdam. 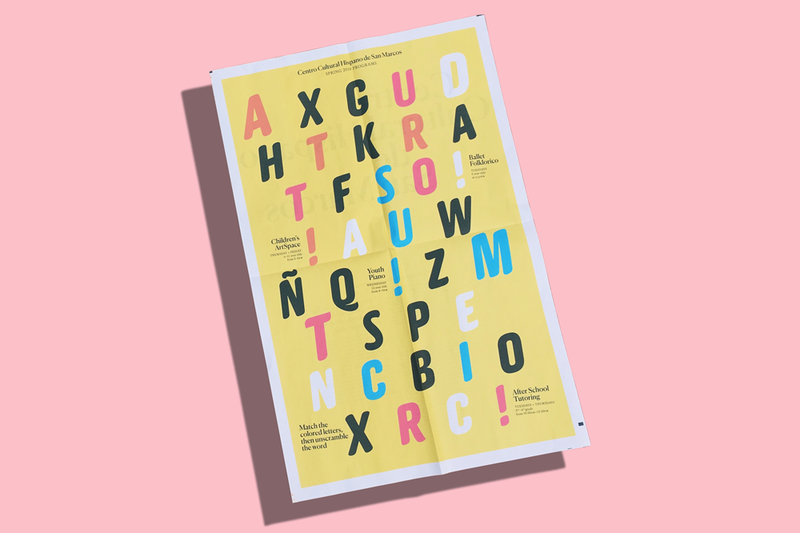 This year's programme is a huge, eye-catching broadsheet designed by Lotte Lara Schröder. 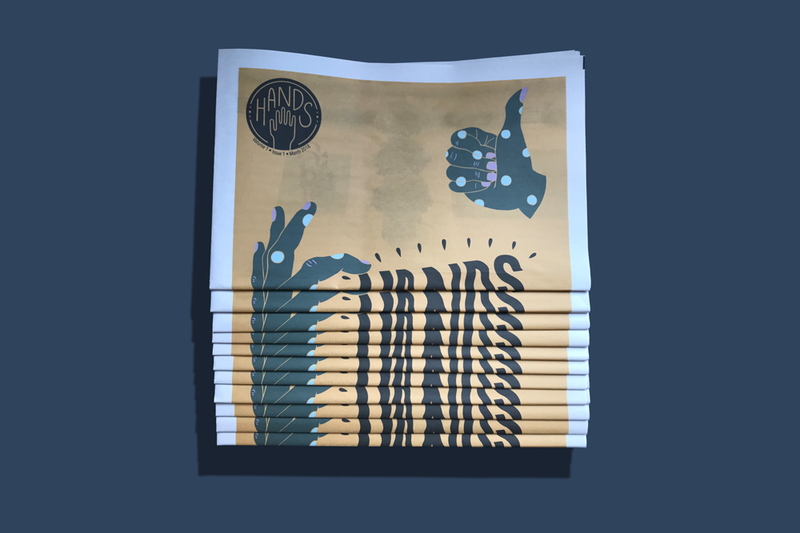 HANDS is a community newspaper founded by Brooklyn-based Chelsea Trout and Arpan Somani, filled with illustrations, writing and photography by contributors from around New York City. "It was a pretty amazing experience being able to just make it what we wanted and call all the shots," says Chelsea (who taught herself Adobe InDesign to make the newspaper!) Cover illustration by Elbows. Launched in 2017, BANOLL is the handbag brand of Japanese-born designer Ayaka Suzuki. To showcase BANOLL's first collection, Ayaka put together a broadsheet lookbook that folds out into a poster. "I love that "not too perfect" feeling that newspaper creates, in an amazing way!" she says. Photography by Koki Sato. 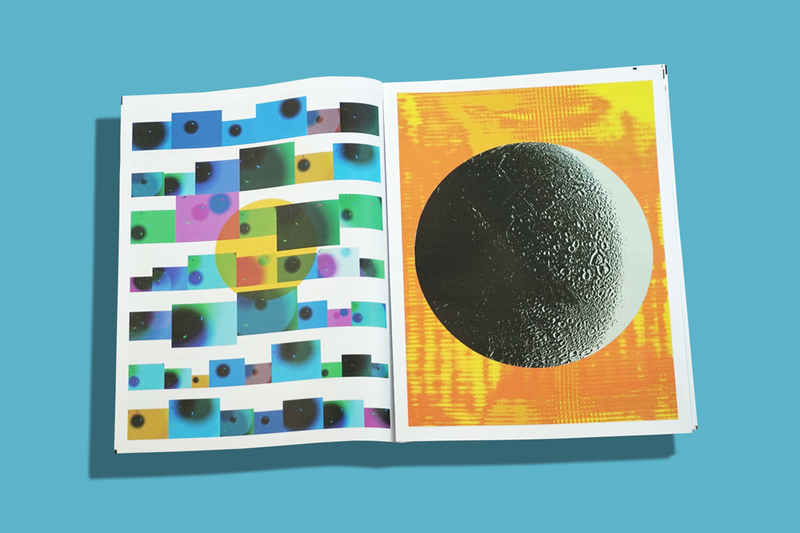 LAD Design created this limited-edition zine as part of WeTransfer's A Message from Earth project, which asked 40 contributors – from photographers to DJs to astronomers– to create a work inspired by the Voyager Golden Record. 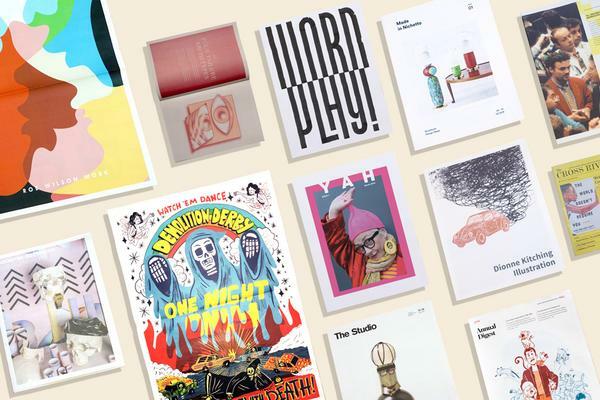 The publication is art directed by Lawrence Azerrad, who designed the Grammy-nominated Golden Record 3xLP Vinyl Box Set and album covers for artists including Wilco, Miles Davis and Sting. He tells us: "We've tried to distill the essence of the project into print, and capture some of the spirit of hope, determination, and goodwill which inspired Carl Sagan and his team in 1977, and inspires us four decades later." The world lost a good dog last month. 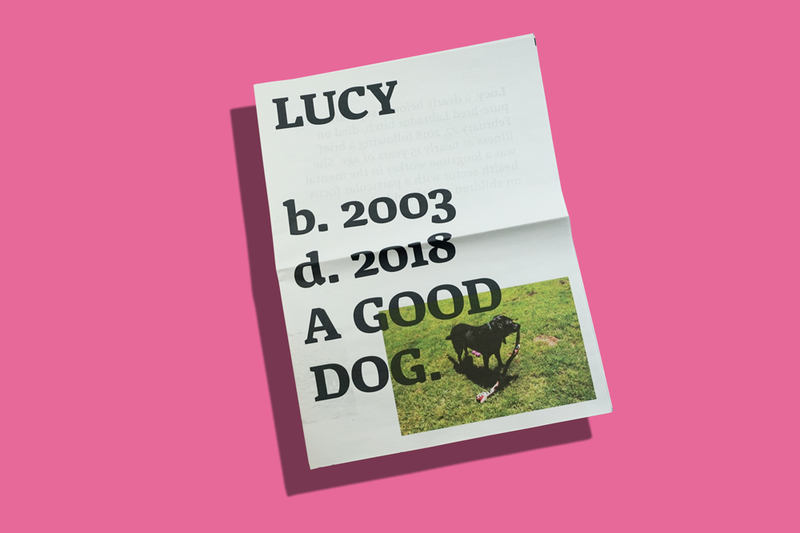 David H. Taylor created this newspaper obituary for his family's black lab, Lucy, who made many friends at David's psychiatry practice in California during her 15 years. "I’m a lifelong obituary reader, so telling her story in that way seemed a natural fit to mark her passing properly," says David, who left copies in the waiting room at his office for patients to read. "She greeted everyone at work and is missed by many people from various walks of life." You can read the text of Lucy's obituary on David's website. Newspaper design by Virgil Taylor. Congratulations to Maya and Cody, who were married in Brooklyn in March. 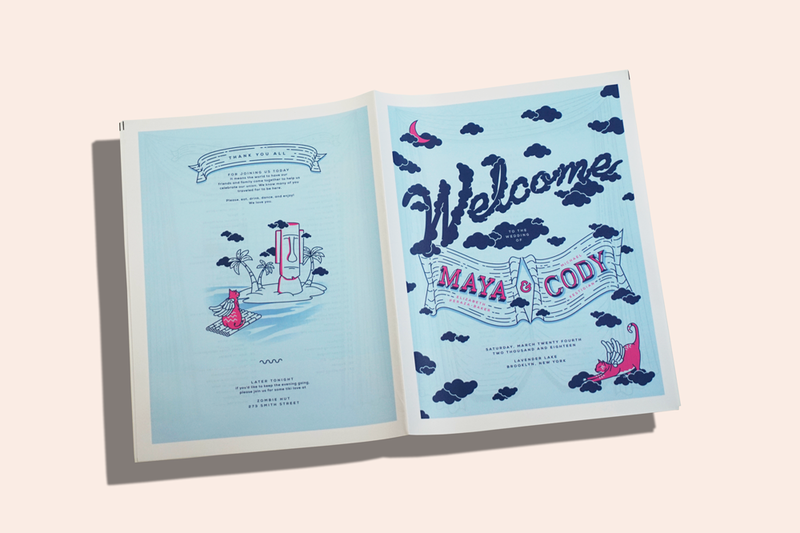 They're both avid zine and paper ephemera collectors, and Maya is a print designer, so their wedding was the perfect excuse to make something fun with paper. "Once we knew we were going to create a crossword for the occasion a newspaper was a natural fit," Maya tells us. "Also, the large format meant we could fit our ceremony, menu, and wedding party all together but still have space for play, like mazes and crosswords." It's a boy! 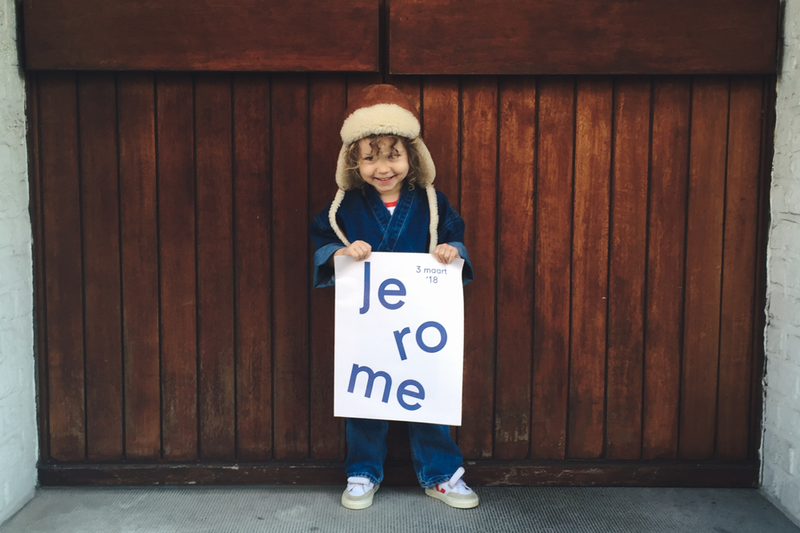 To announce their birth of their son Jerome, Lore Laporte and her family, who live in Belgium, sent this cute newspaper to family and friends. Lore designed the newspaper herself – that's Jerome's proud big sister holding it in the photo above. 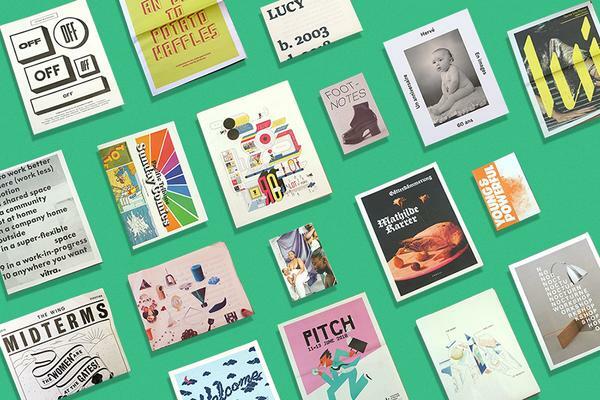 Manchester-based design agency Shape use this newspaper when meeting clients for the first time. 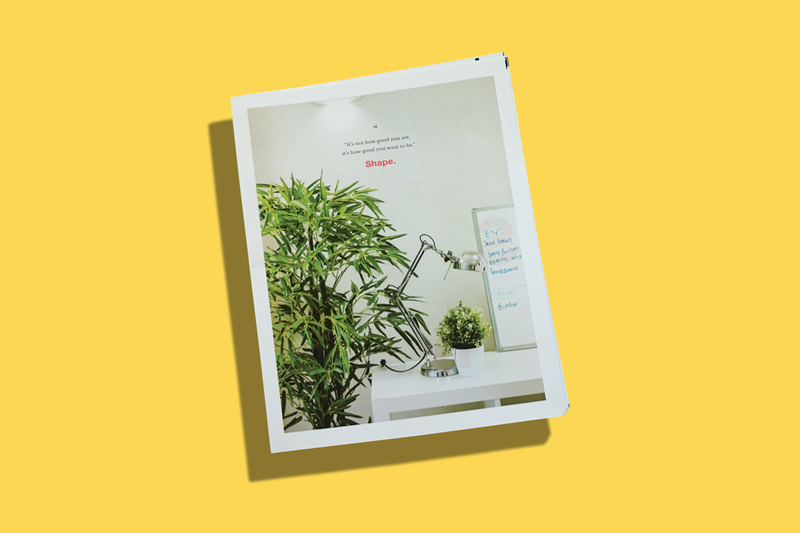 "It reinforces our expertise, showcases our portfolio, explains who we are and what we do, shows our team members, adds personality to a pitch, and instills trust with case studies and testimonials," explains Shape co-founder Andy Golpys. "The design is an extension of our website and helps a client decide whether we are the right agency for them." From "serious news stories to frothy features" the headline fonts in this specimen from Commercial Type, the studio that created The Guardian's new font and logo, can do it all. Printed for the Society for News Design conference in New York City. Buy a copy in the Commercial Type shop. Space Scoop is an astronomy news service for kids, published by Universe Awareness. 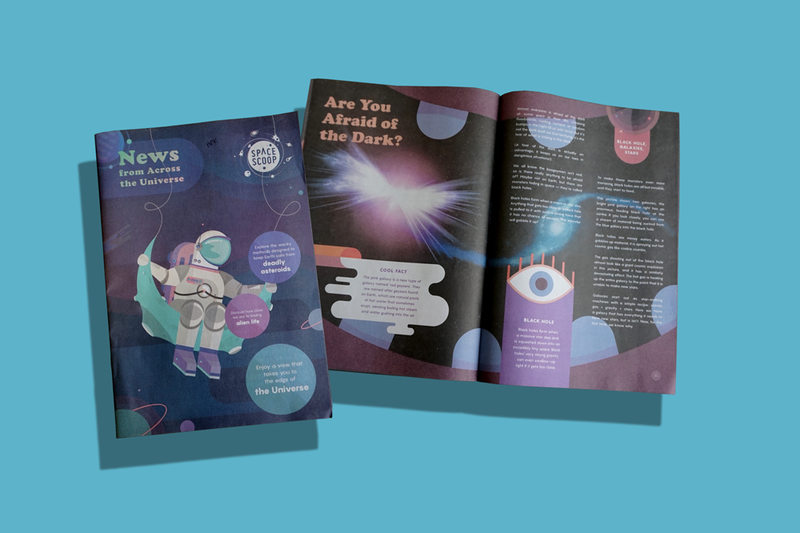 Since 2011, Space Scoop has produced over 350 stories for young children, exploring everything from exoplanets to cosmic reionisation, and a team of volunteer translators has made the text available in more than 40 languages. In this newspaper edition, designed by Aneta Margraf-Druć, articles explain what happens to old satellites (they're sent on a "graveyard orbit") and the methods used to protect Earth from asteroids. El Centro is an experimental publication made for the Hispanic Cultural Center, Centro Cultural Hispano de San Marcos – a non-profit community organization in one of the first Mexican American "barrios" of San Marcos, Texas. "We wanted to tell the story of Centro's creation and highlight its roots in San Marcos," explains designer Megan Reid. 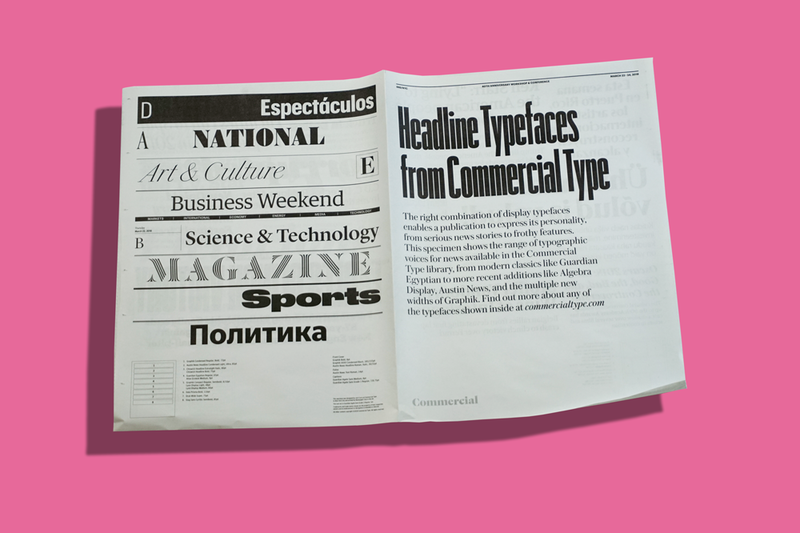 "We chose a full page title set in Canela, a typeface designed by the brilliant Mexican typographer Miguel Reyes as a bold way of announcing the newspaper." On the reverse is a poster listing the spring schedule of programs at Centro. 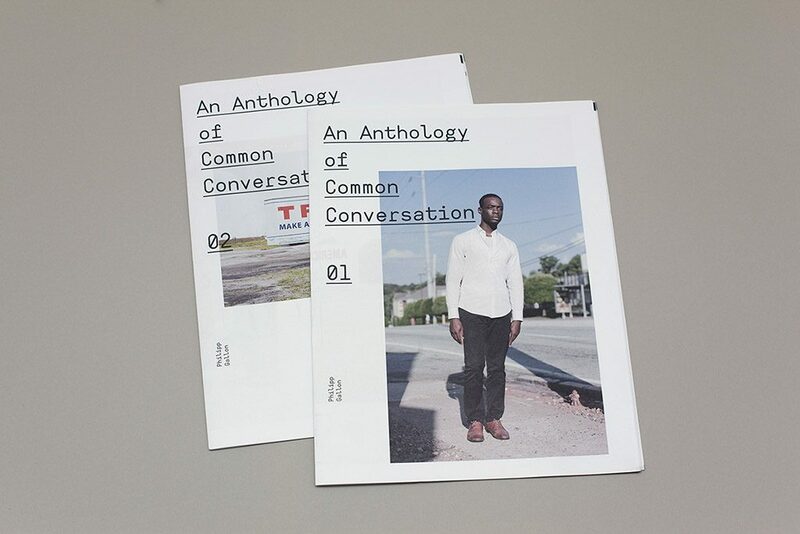 An Anthology of Common Conversation is a series of newsprint photo books exploring social and political changes in the USA. German photographer Philipp Gallon started the project in 2015, and has documented people and places in 31 states since then. He designed the newspapers, the first two in a series of six, as "a hybrid between publication and exhibition", which can be read or taken apart and displayed on the wall. 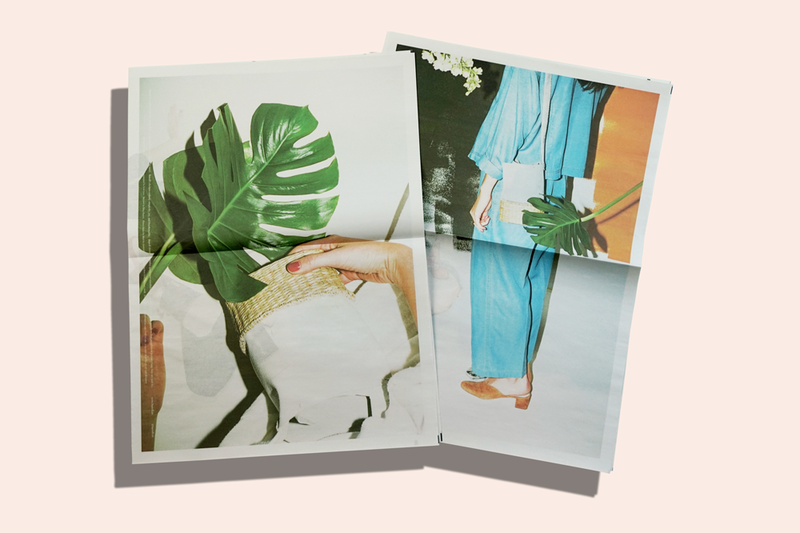 "Newsprint's such a beautiful way of printing photography," he says. "I love the industrial aesthetic."